Betty Lucas is a fierce, independent Na-Cho Nyak Dun Elder armed with generations of knowledge passed down to her. In her home in Mayo, Elder Betty, 81, sits at her kitchen table, the smell of rabbit stew and freshly brewed tea wafting through the air. The cold weather doesn’t stop her from packing up her supplies and heading out to her camp to get back to the land and do some sewing. Lucas says nothing is more important than being outside in her territory. She camps by herself, except for the company of her dog. She packs wood and takes care of things. Lucas remembers spending time out at the Old Village, picking berries all day, or going hunting or trapping, and being with her friends and family. Lucas spent a large part of her life living off of the land. Lucas still traps lynx, martins, tans hides and picks berries. It reminds her of running around the Old Village: “we go out, we filled ourselves up with berries, we walked around in the bush all day,” she recalls. She says she hopes that the First Nation will continue planning trips for citizens to get back to the land. It is important that Na-Cho Nyak Dun (NND) citizens stay close to the land and learn about the way their ancestors lived on the land so that they are better able to make decisions, says NND Heritage Manager and Citizen Joella Hogan. Through the Na-Cho Nyak Dun Final and Self-Government Agreement the First Nation has decision making power and input into what happens on their Settlement Land and Traditional Territory. “Land claims and self-government have made us the key decision-makers. People are better decision-makers when they can understand the land, our connection to it, and the knowledge systems,” Hogan says. “It’s important for the individual to be able to connect with the places where our ancestors travelled, where their families lived. It’s important for them to be able to harvest and continue traditional and subsistence activities and to be able to do modern activities too - to be able to change and adapt,” she says. The First Nation of the Na-Cho Nyak Dun is the northernmost community of the Northern Tutchone. Na-Cho Nyak, meaning ‘Big River’ in English, is the Northern Tutchone name for the Stewart River, which remains important to NND citizens. Through the negotiation and signing of the Na-Cho Nyak Dun Final Agreement in 1993, the First Nation is now better able to maintain traditional ways and ties to the land. Nacho Nyak Dun government departments work with citizens, other governments and agencies on collaborative planning for a number of heritage sites within their settlement lands and traditional territory. This includes the restoration of the ‘Old Village’ site, oral history for Lansing Post, rebuilding traditional trails, and outdoor camps at Ethel Lake, where people can take part in cultural activities such as drying fish, sewing, beading and telling stories. A big part of this work under the Final Agreement is to continue the role of citizens as stewards of the land and to monitor any changes, Hogan says. “We are trying to give opportunities for people to do group activities, group trap-lines, and cultural events,” she says about Na-Cho Nyak Dun’s efforts to keep the connections to the land and stories strong. “There has been a lot of disconnect from some of those places, we are trying to connect people with these places,” she says. Lansing Post, where some Na-Cho Nyak Dun people lived prior to moving into the Mayo area, was incredibly important for our people and still is because people in the community still have the knowledge of that place,” Joella Hogan explains. The same goes for places such as Ethel Lake and Fraser Falls, along the Stewart River. At Ethel Lake’s camp, the First Nation hosts the Bachelor of Social Work Program from Yukon College every two years. “We use that opportunity to share our knowledge, our culture, our special place on the land,” Hogan says. This helps educate future social workers in the territory about First Nation culture so they can do their jobs better, being grounded in an understanding they’ve gained on the land with Na-Cho Nyak Dun citizens. 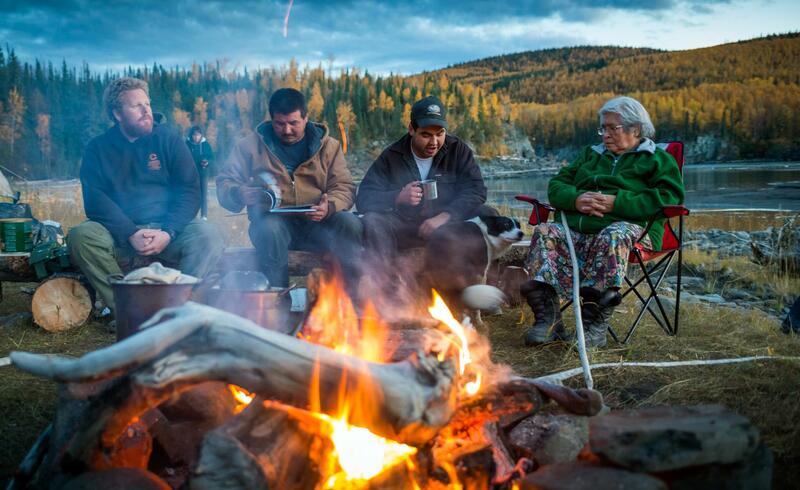 The mining industry, the Fish and Wildlife Management Board and others also use Ethel Lake camp to learn about Northern Tutchone traditions and culture. Frank Patterson, also a Na-Cho Nyak Dun citizen, says he considers himself an Elder-in-training. So that means lots of learning, and teaching, too. He takes his grandchildren to Te Kwan Te Mun (Ethel Lake). Patterson’s favourite memories are going trapping as well as salmon fishing with his grandchildren. “Then, the teachings carry on, you teach them to respect the land,” he says. Nacho Nyak Dun First Nation citizen Blaine Peter says he takes his two young children out on the land as much as possible. His grandfather taught him how to live off the land -- hunting, trapping and fishing. For Peter, it is crucial that he teach his children, Ryder, 5, and Preston River, 3, about this important relationship in order to pass on the teachings and knowledge from what he’s learned. Peter says he is doing everything he can to pass the traditional teachings on. “When we make decisions about the land, we need to be grounded on the land. We need to be educated about the land; we need to hear those stories and that knowledge from Elders.” Joella Hogan says. “With that knowledge, Na-Cho Nyak Dun can make decisions about its land based on the memory and knowledge of previous generations,” Hogan says.